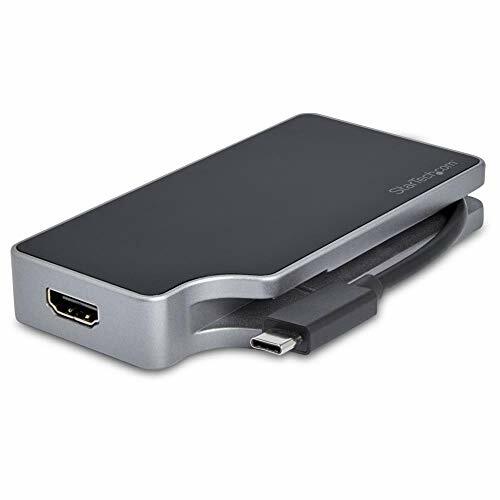 Recently StarTech.com released two new USB-C multiport adapters to maximise productivity for business professionals on the road or in the boardroom. While I am rarely in a boardroom, I have been using both of these devices for the past few weeks. With USB-C we now finally have viable options to use laptops as a proper desktop replacement. For me I run three monitors, so a single HDMI out on most laptops won’t cut it. With USB-C, depending on what the port is rated at, you can achieve data rates of 10 and 20 Gbit/s (1250 and 2500 MB/s) which is enough to drive multiple monitors and various other accessories. Furthermore, thanks to USB Power Delivery, it is possible to both power an ultraportable and uses its USB-C port for accessories. This is perfect for a business person that is on the move a lot, you can have a lightweight laptop, but then still use it as a desktop as and when needed. While I am a hardened desktop user, I do work from an office on a laptop several times per month, and working from multiple full-sized monitors compared to a tiny laptop screen makes life much easier. This USB-C multiport adapter with HDMI and VGA is like four adapters in one, giving you flexible video output, a USB 3.0 port and Gigabit Ethernet port, a hideaway cable, plus robust power and charging. The adaptor also features an ethernet port providing gigabit wired connectivity. During my review period, this has been the main adaptor I have used, I have a Dell XPS 15 which lacks ethernet so I am able to use this to both connect to a monitor, attach a full-sized keyboard and get a fast-wired connection. 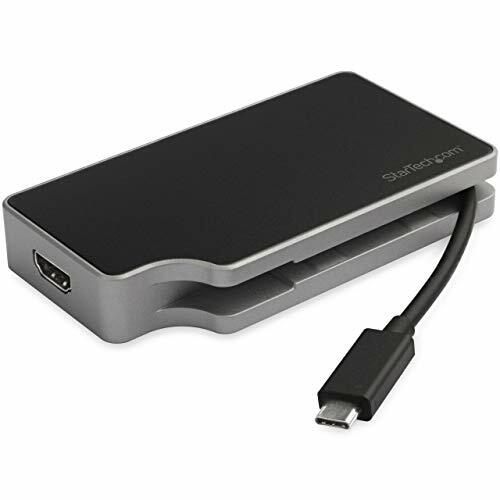 The Dell XPS does not have USB-C power, but I have a second Latitude laptop that I use for a secondary screen at home, and I also use this adaptor here, and with the help of power delivery USB adaptors, I don’t have to rely on the original charger anymore either. Overall this has been perfect for my office use giving me all the ports and flexibility I need from my laptop. This costs £101.33 which for a consumer would be quite expensive, but it is targeted at the business end of the market and I would say it is not unreasonable. On Amazon there are not many competing models that offer both HDMI and VGA outputs, with ethernet and power delivery either, so the pricing, while expensive, is fair. With this only have display port outputs I had less need for it, but I can appreciate how it could be an essential tool for a business person on the road a lot. If you do presentations, or regularly connect your laptop to monitors this adaptor ensures you will always be able to connect thanks to it featuring every display port used since I started using computers. This is priced at a bit more reasonable £79.31 on Amazon, again there are not many competing products, the closest being from StarTech.com themselves with a 4-in-1 display adaptor which I think does not offer power delivery but costs £57.15.